Presiding Officer, Legislator Norma L. Gonsalves attended Boy Scout Troop 577 Eagle Court of Honor for Christopher Granito which was held St. Frances De Chantel in Wantagh. Christopher, a resident of Wantagh, undertook a project to perform renovations at his local Birthright in Wantagh. Birthright, a non-profit volunteer organization, provides counseling and other help to young women who are pregnant. They offer counseling, pregnancy test, layettes, maternity clothes and referrals for reduced medical fees. Christopher painted three office rooms with wall to wall carpet, installed planter boxes, a new bookshelf, replaced all ceiling tiles and florescent lighting, and painted a “Tree of Life” mural. He organized 60 volunteers and totaled over 400 hours to complete his project. 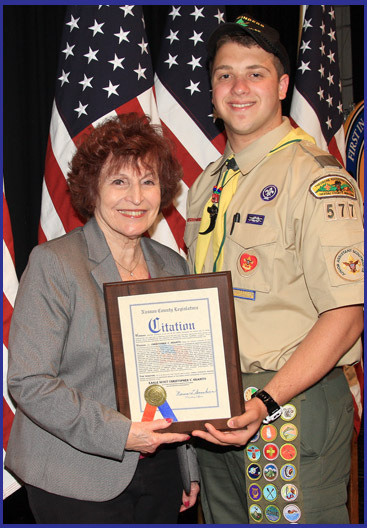 Pictured (l-r): Presiding Officer Norma Gonsalves and Eagle Scout Christopher Granito.